This was a truly wonderful day out on the beautiful Pembrokeshire coast, cooking on the beach. This is the perfect example of just what is achievable on just one gas ring. The recipe took around an hour at a casual pace and fed… well I lost count of how many portions we got from this great dish. It was a wonderful privilege to be allows to drive onto the beach and film there and Jonny’s family were truly wonderful and so welcoming. This was a very special day out for us and so I would like to thanks a few folks who made it happen. 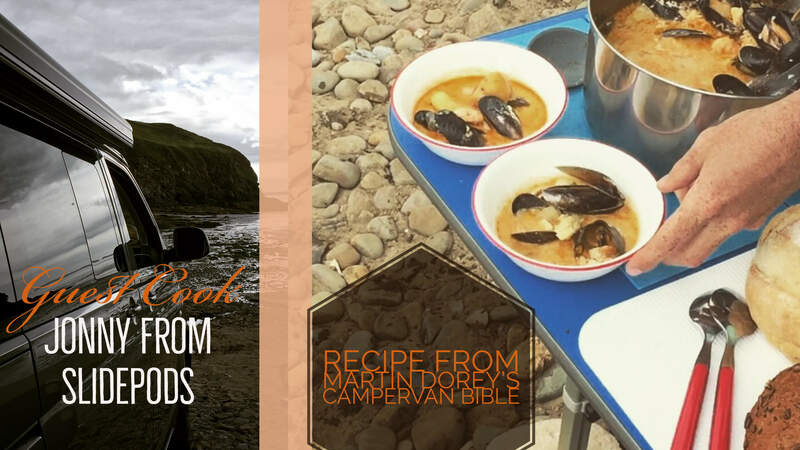 Thank you to Jonny from Slidepods http://slidepods.co.uk/ cooking a beautiful camp friendly fish recipe from Martin Dorey’s campervan bible. Mr Dorey kindly gave permission to use his recipe in this video which is very much appreciated. Take a look at Martin’s site for his many great books Thank you to David for access to the beach and permission to fly the drone and last but not least Jonny’s family for being so welcoming. See video for instructions or Page 246 of the Campervan Bible if you own the book.